I've been doing a lot of thinking about making the choice to continue blogging. For a few years now, I've gone back and forth, trying to decide whether I should slowly disappear into the abyss of people-who-used-to-blog (where there are so many awesome people who I still think about, even years after they went off the grid), or whether I should buckle down and start posting with regularity and direction once again. Sometime earlier this year, I decided on the latter. As much as I almost envied people who quit blogging or lost interest altogether, there was always something stopping me from giving it up completely. I wanted to hold onto this space, even when I was hardly posting at all at a certain point. To be honest, for a long time, I thought there was only one way to be a good blogger. I felt I had to read and comment on the blogs of everyone who took the time to read and comment on mine. Scheduling posts was less authentic than writing and posting them on the same day, because then I wasn't just writing in the moment. There were things I didn't think I should write about: religion, the un-pretty parts of life/marriage/what-have-you. I thought if I put any effort into monetizing my blog, that I was selling out. I felt that if I didn't have something absolutely original to put out there, that I was just adding to the noise. I also struggled a lot with coming to terms that at this point in life, blogging will never be like it was five or six years ago. I kept wanting it to be the same, but it wasn't—and it can't be. Instead of being annoyed or frustrated by that, I've decided to be so incredibly thankful that I was able to be a part of that golden age of blogging when it was all so pure and simple and basically like reading each other's journals. No photos, no social media, no DIY, no ad revenue. Although each of those things are now a piece of my internet presence these days, I definitely do feel grateful that I started out without the pressure and perfection of the current blogging landscape. The quotation at the top of this post may seem to be overstating it a bit—it's not as though I feel my one calling in life is to be a blogger. 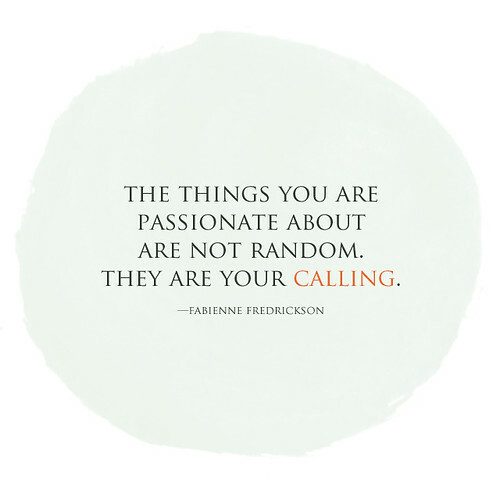 But what if it is one of many callings? I've been doing this for so many years now, I've met so many people and created so many new friendships, I've been able to share pieces of my story with people all over the world. That's a big deal, when you stop to think about it. Not that I'm a big deal—after all, there are so many other people out there doing the same thing. But this whole blogging this is a big deal. I may not share all of my life or thoughts these days, but it is still a big thing, letting people into your world and sharing your life in this way. These days, I'm happy with where I've landed. I'm glad I stuck around. I feel like I'm supposed to be here, supposed to write and share and create. And I am finally able to be a bit more forgiving of myself and what I'm able to offer here. I'm still finding a balance between blogging for myself, blogging for a readership and blogging for (a very humble) profit, but my goal is to continue learning and growing during the next year. There is so much I want to share, so much I want to say, so much I want to create. Now feels like the perfect time to truly invest my time and effort into this blog, and I'm happy to say I'm here to stay. I seriously could have written this on my own blog. I definitely miss the days of some of my favorite small time bloggers and sometimes I wonder why I still write. I feel like I'm finding that balance slowly but surely and I've come to realize I need it more than I think. You've summed up everything I've thought and felt about blogging for probably two years now. I remember starting out when it was very low-pressure and you read blogs because you found people's lives genuinely interesting. And now there's a lot of stuff added - which isn't all bad, but sometimes detracts hugely from the point that we've long understood blogging to center around. I'm glad you're sticking in the game. I've watched so many people leave their blogs, and it's sad to lose those friendships and interactions. I made my choice to jump back into blogging and make of it what I could with what I was willing and able to give, and I'm glad to hear I'm not the only one making that decision. This post is perfect, I feel the exact way. I don't think I'll ever make it as a big blog who schedules post and does all this other and extra stuff. I just blog for me, blog what I want to share. I love your blog! I'm glad I found it. Love this post. I decided a few years ago I would blog for myself, it makes blogging so much more fun/worthwhile that way.